Degenerative joint disease is a mechanical abnormality of the joints leading to wear of the articular cartilage with eventual full thickness loss with involvement of the subchondral bone. Estimates indicate that about 5 million people in the UK have X-ray evidence of moderate to severe osteoarthritis of the hands, knees and hips, with 36 million working days lost in 1999-2000 in Great Britain, representing £3.2 billion lost production. The cost to health and social services during this time period for treatment of all types of arthritis (including inflammatory) was £5.5 billion with prescription costs totalling £341 million and hip and knee replacements totalling £405 million. Symptoms and signs include pain, reduced mobility of the joint, joint line tenderness, reduced range of motion and an effusion. Commonly affected joints include the knees (most commonly affected joint) and hips, hands and feet although any cartilaginous joint could be involved. 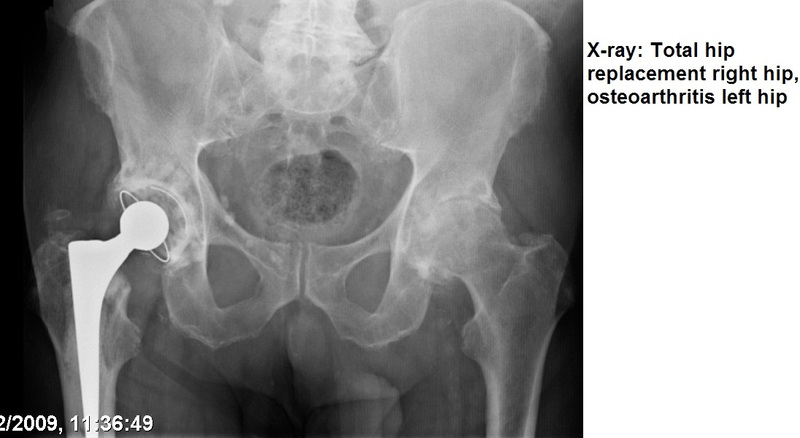 Osteoarthritis is rarely symmetrical and is not as deforming or destructive as inflammatory arthopathies. X-rays are usually all that is required for investigation. However, if there is complex deformity, other imaging may include CT to determine the degree of bone loss and any malalignement, MRI to determine the degree of cartilage loss and ligament integrity, and isotope bone scan to detect any underlying bone abnormality (tumour or infection). 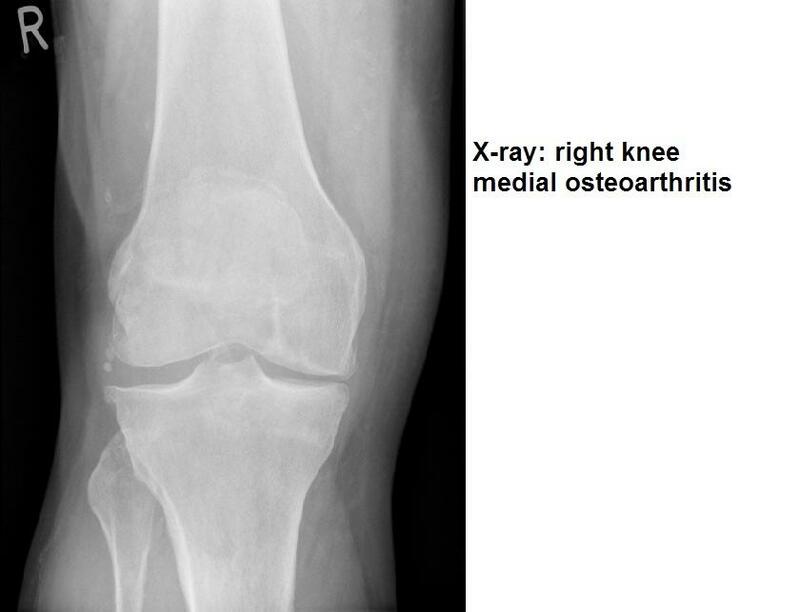 Osteoarthritis may be primary or secondary. This is a chronic degenerative disorder that is related to age (usually over 45 years of age), although there is now emerging evidence also linking it to a genetic predisposition. Reduced proteoglycan content in the articular cartilage and an increase in water content leads to the cartilage being more vulnerable to wear. The wear process includes degradation of the collagen fibres, leading to further degeneration of the cartilage. With deterioration and loss of the joint bearing surface, subchondral bone may be exposed. As weight-bearing occurs on the exposed bone, it will become hardened, eburnated and sclerotic. 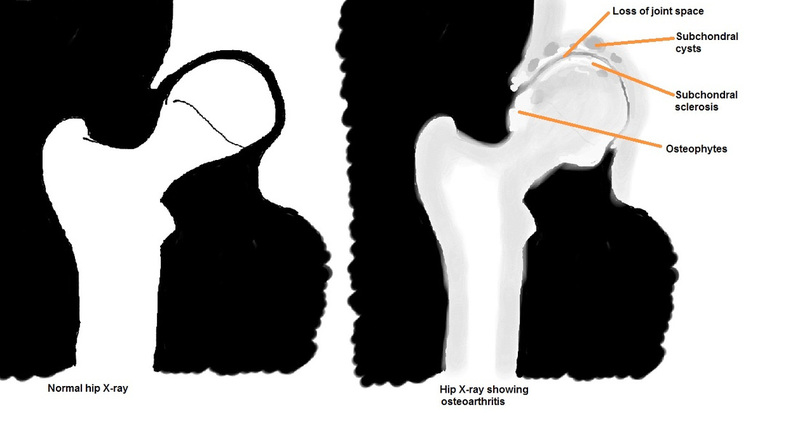 The cartilage loss also leads to formation of osteophytes and subchondral cysts. Life-style modification with weight-loss, graded exercise, mobility aids (walking stick orframe), physiotherapy and occupational therapy with home modifications. Analgesia usage, including paracetamol, NSAIDs and opioids, escalating according tothe WHO pain ladder. Joint injections, including steroid and hyaluronic acid injections, may give some short-term benefit but are associated with risks and are falling out of favour. There are no procedures proven to lead to cartilage regeneration. Evidence shows that arthroscopic debridement for knee arthritis gives no prolonged benefit. Surgery involves excision of the arthritic joint and replacement with an artificial joint articulation. The most common procedures are total hip arthroplasty (59,000 performed in UK per year) and total knee arthroplasty (62,000 performed in UK per year) which give predictably good pain relief and mobility, with excellent survival rates up to 10-20 years after surgery.